Unlike the Insert from File and Write to File commands, which copy data 'as-is', the Import and Export commands perform conversion from or to comma-separated values. 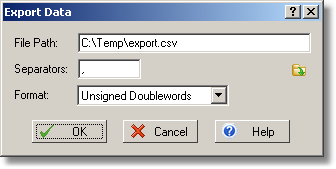 CSV files is the name commonly used for text files, containing values, separated with commas. FlexHEX allows using other than comma separators, but we are using the name CSV anyway. Exporting data to a CSV file is simple: select the block you want to write out and select the Edit -> Read/Write Data -> Export menu command. Enter the path of the output file, the separator string (if other than standard comma and space), and the data format. Pressing OK will create the text CSV file. The Import window looks identical and works the same way except for the reverse direction of data copying.